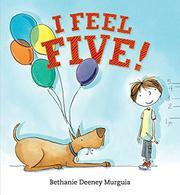 Fritz expects to feel totally different when he turns 5, but it turns out that 5 feels a lot like 4. He still can’t tie his shoes, snap, whistle or master the monkey bars. And not even one of his teeth wiggles. Self-assured pen, ink and watercolor illustrations produce vivid renderings of a young boy’s bounce, his tousled hair, bony ankles, fluttering superhero cape, inflated birthday expectation and subsequent deflation. Fritz’s day plays out in soft watercolor scenes that make fine use of page turns, page composition and supremely crisp white space. Double-page spreads evoke tender feelings: an ecstatic leap from bed on his birthday morning (gold beams surrounding his lithe, lean body) and, especially, his sad sit-down beneath an apple tree (a foggy gray wash muting the entire playground). A new friendship (with a girl!) makes Fritz feel a little more 5, as well as a little blushed and bashful. Every child knows how it feels to squirm gleefully in the throes of a big buildup and also how it feels to stifle tears after a big letdown, making Fritz’s story universally appealing.